I was planning to do a full review of this set, but after sitting on it for two months, I realize I don’t have an awful lot to say about it. Soooo... I’m saving myself the effort and just doing a short blog review. 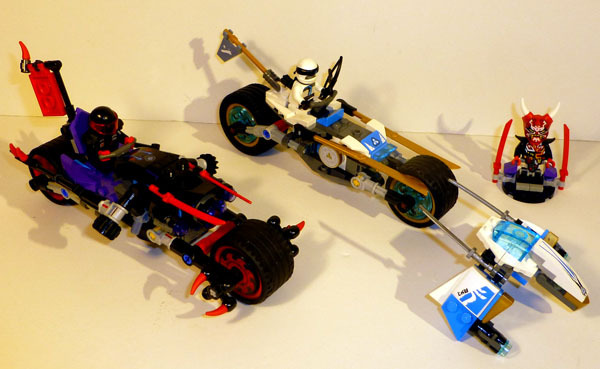 This set consists of two motorcycles, a popular vehicle to create in the theme. (There’s generally at least one motorcycle set per year, usually around the $20 mark.) This set goes for $29.99 and has 308 pieces. There’s not exactly a lot of great pieces here, but white, dark azure, and gold go on Zane’s bike, and black, red, and purple show up on Mr. E’s bike. The two main new pieces are the new blade element and the Oni Mask of Vengeance. 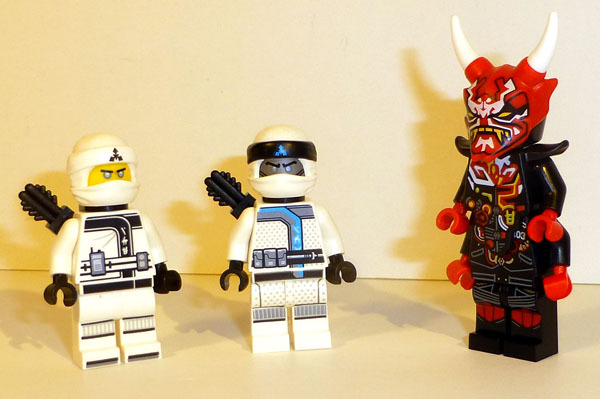 This is the cheapest set to get the latter, and white it’s cool that it clips onto a standard minifig helmet, it’s disappointing that there’s no real way to a fig to grip it, considering the mask changes hands in the show a couple of times. The katana in red are also a nice touch, and it’s cool to get the weapons in a new color. The two minifigures are certainly a highlight. Zane is exclusive here (he does appear in his Snake Jaguar disguise in another set, which is a bit odd that he’s not disguised here, given the set’s name.) Zane’s outfit actually looks remarkably similar to his movie version, with just a few subtle color and texture designs. Mr. E, meanwhile, is the new bad guy, and certainly seems like one of the strongest in the antagonistic bike gang this season. He has a badge on his torso with the Ninjago script letter “E” on it, for his name, and the script spelling out “SOG” on his back for “Sons of Garmadon.” (SOG doesn’t sound particularly intimidating, IMO.) The mask he’s after also comes with a second set of arms to let him better imitate Garmadon. Overall, an interesting fig, and his style matches with the Oni Mask nicely. 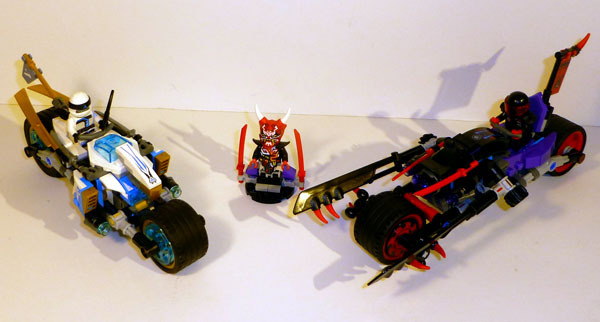 The two bikes have some individual style to them, but what disappointed me the most was that they’re basically built atop the same base chassis, which has also been used in a few other Ninjago motorcycles in the past. I feel like the motorcycle designs are just getting boring, and even with an entire bad guy team based on motorcycles this wave, I still don’t think any of the designs really stand out. Still, to be fair, it’s a good design. (It’s hard to change the designs if you’ve already got a really solid build. And I understand that not everybody has been collecting Ninjago motorcycles since 2011.) The big standout on Zane’s bike is the Eagle drone, which can easily pop off and fly out for reconnaissance. It’s a nice callback to Zane’s falcon, although the style feels more like something out of Legends of Chima. (For reference, the Ninjago script on the wings reads “Ice”.) Mr. E’s bike focuses more on the function; the spikes on the front wheels work to lift the blades up and down in a fluid chopping motion, which works quite well for such a simple design. He also has a cooler seat on the back, which also includes some Ninjago script that spells out “D81” although I don’t get the reference here. This is definitely a cool set, though I agree that the bikes are not super exciting to someone who's been collecting for a while. I really wish we could get another bike set with a play feature as fun as Kai's Blade Cycle's pop-out blades. Besides the falcon motif on Zane's bike, another thing that I like about it is how the Dark Azur really makes the color scheme pop. I feel the same way about the Flame Yellowish Orange on Kai's Katana V11 and the Bright Yellowish Green on Lloyd's Ninja Nightcrawler, and I am really hoping the next vehicles for Cole, Nya, and Jay will also have exciting color combinations like that. But if they don't I might just have to MOC Season 8 style ninja vehicles for them myself! Regarding Mr. E, my difficulty avoiding Season 8 spoilers from the episodes that have already aired in Australia means I have some theories about what his identity might be, but in any case I'm really grateful that the designers have done a better job lately ensuring that the identity of "mystery characters" isn't obvious from the very first set they appear in.